The Star of David is a symbol commonly associated with Judaism and the Jewish People. In Hebrew, it is called Magen David (“Shield of David”). A six-pointed star, the Star of David is composed of two overlaid equilateral triangles, one pointing up and the other pointing down. These three entities are each comprised of a pnimiyut (inner dimension) and a chitzoniyut (external dimension). The Torah is comprised of both exoteric teachings (the Talmud, Jewish law, etc.) as well as esoteric teachings (the Kabbalah). G‑d’s “revealed” energy permeates and provides existence to all worlds, but His essence is completely hidden, transcending all of creation. Similarly, the soul (which is a reflection of G‑d2) has a revealed element, that level that expresses itself within and vivifies the body, as well as an essence that transcends the body. The double triangle of the Star of David (Magen David) symbolizes the connection of both dimensions of G‑d, Torah and Israel: the external level of the soul connects to the external expression of G‑d via studying the exoteric parts of Torah; the essence of the soul connects with G‑d’s essence through the study and application of the teachings of Kabbalah. Kabbalah teaches that G‑d created the world with seven spiritual building blocks—His seven “emotional” attributes. Accordingly, the entire creation is a reflection of these seven foundational attributes. They are: chesed (kindness), gevurah (severity), tiferet (harmony), netzach (perseverance), hod (splendor), yesod (foundation) and malchut (royalty). 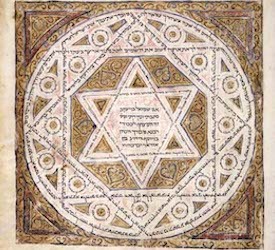 Correspondingly, the Star of David contains seven compartments—six peaks protruding from a center. The upper right wing is chesed. The upper left wing is gevurah. The upper center peak is tiferet. Kabbalah teaches that tiferet finds its source in keter, “the Crown,” which is infinitely higher than all the divine attributes which are involved in the “mundane” pursuit of creating worlds. The lower right wing is netzach. The lower left wing is hod. The center is yesod. Yesod is “Foundation,” and as such, all the other attributes are rooted in, and rise from, this attribute. The star’s bottom that descends from its belly is malchut—the attribute that absorbs the energies of the higher six attributes and uses them to actually descend and create everything—and to “reign” over them. The Star of David is an important symbol of the Jew and the Jewish people, but is is just that: a symbol. Even more important is to live, think, and behave as a Jew. Put a mezuzah on your door, study some Torah, eat kosher food, welcome the Shabbat with candles lighting and a festive meal, and you've become a living Star of David. The fact that in a triangle each of the three corners are connect to the two other ones demonstrates that the Jewish soul is itself knotted to G‑d. Torah study and observance doesn’t create a connection between the Jew and G‑d—it merely brings it to light. What's the Significance of the Number Eight? Why Are There So Many Stars and Galaxies? Is There Anything Wrong with Sinful Thought? Do Jews Believe in Guardian Angels? 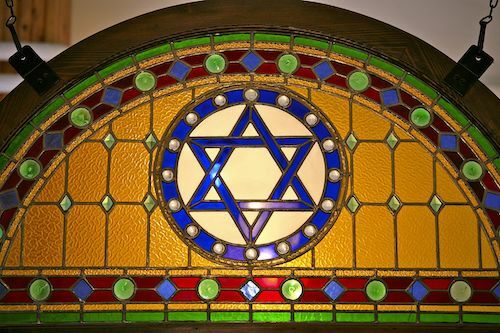 Is the Star of David a Jewish Symbol? What is the origin and history of the Shield of David?
" wisdom before age ; sage "
The star forms 8 triangles....6 and 2 ....look again my christian friend . Perhaps you need to look from within next time ? P.S. Where most men dare to enter ! Technically according to Torah Israel was only given the menorah as symbol. At one point there was a debate about using the menorah in Israel’s flag.